"In 1854, Anthony Burns, a 20-year-old black man, was put on trial in Boston under the Fugitive Slave Act of 1850. Retelling the events of the trial, which polarized the city, Hamilton shows the kind of political issue which brought the nation to fever pitch in the decade before the Civil War. 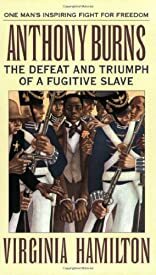 Hamilton's biography is actually a 'docudrama' which centers on the often silent, mistreated, and humbled runaway slave. The insights Hamilton gives into the personal side of slavery are moving and unforgettable." --(starred) School Library Journal. "Does exactly what good biography for children ought to do: makes them feel what it was like to be that person in those times." --(starred) Horn Book.